CHINESE blogger and activist Michael Anti wants to know why he is less worthy of a Facebook account than company founder Mark Zuckerberg's dog. Anti, a popular online commentator whose legal name is Zhao Jing, said his Facebook account had been suddenly cancelled in January. Company officials told him by e-mail that Facebook had a strict policy against pseudonyms and that he must use the name issued on his government ID. Anti said his professional identity as Michael Anti has been established for more than a decade, with published articles and essays. Anti, a former journalist who has won fellowships at both Cambridge University and Harvard University, said he set up his Facebook account in 2007. By locking him out of his account, Facebook had cut him off from a network of more than 1,000 academic and professional contacts who knew him as Anti, he said. "I'm really, really angry. I can't function using my Chinese name. Today, I found out that Zuckerberg's dog has a Facebook account. My journalistic work and academic work is more real than a dog," he said. 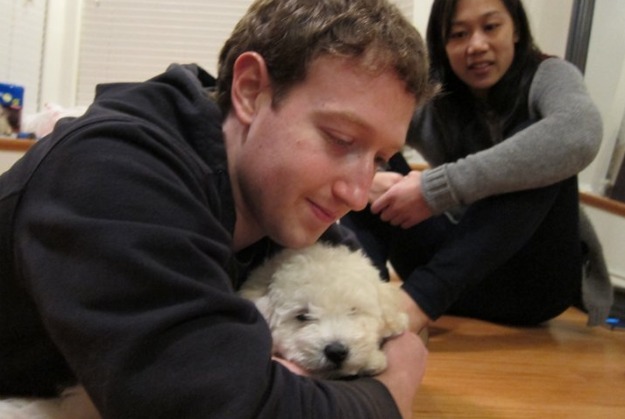 Zuckerberg recently set up a Facebook page for "Beast," complete with photos and a profile. Unlike Anti's, however, the page for the puppy doesn't violate Facebook's policies because it's not meant to be a personal profile page. Rather, it's a type of page reserved for businesses and public figures that fans can "like" and receive updates from on their own Facebook pages. Facebook said it does not comment on individual accounts, but added that it believes a "real name culture" leads to more accountability and a safer and more trusted environment for people who use Facebook. "This viewpoint has been developed by our own research and in consultation with a number of safety and child protection experts," Debbie Frost, Facebook's director of international communications and Public policy, said in an e-mail to The Associated Press. Facebook said in an e-mail to Anti that the company had "tried to keep the rule simple and fair by saying personal profiles must always be set up in the real legal name of the individual concerned." Dissidents in a variety of countries have argued that Facebook's policy can endanger human rights activists and others if their identities become known. Anti said there is a long tradition in China for writers and journalists to take pen names, partly as protection from retaliation from authorities. If Facebook requires the use of real names, that could potentially put Chinese citizens in danger, he said. "For my fellow Chinese, this policy could easily help Chinese police identify them," he said. It's not the first time Anti has had problems with an Internet site. In 2005, his blog on a Microsoft website was shut down by the company following pressure from Chinese officials. Microsoft's action led to a public outcry.